Naturally, as a result of growing up in the 80’s and 90’s, Sean began his guitar playing cutting his musical teeth on rock, pop and metal guitar. However, he has performed with the Lyric Theater Orchestra, Oklahoma City Philharmonic, and many smaller groups. He graduated from the University of Central Oklahoma in 2001 with a Bachelor of Music Degree in Guitar Performance. He is a 4th generation student of the great Francisco Tárrega. 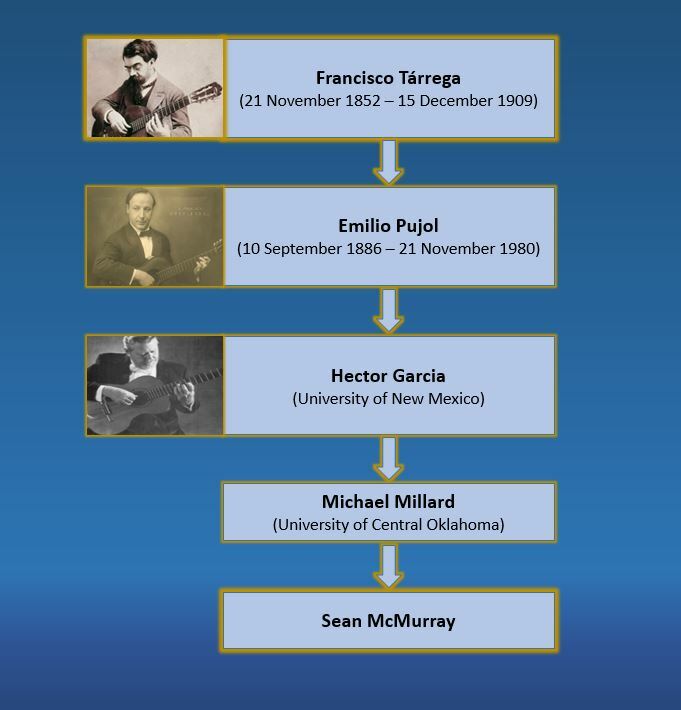 Tracing the Lineage of Teacher to Student from Francisco Tárrega to Sean McMurray.